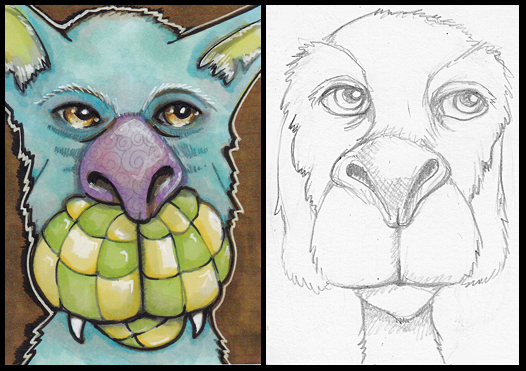 Each 2.5″ x 3.5″ Copics. I have often said as long as I am making new art, it’s ok if it’s not exactly the art I planned. And I stick by that. Particularly when being productive! It’s a bit of a bummer about the painting but I suspect the cute might make the jump to acrylics in February. Thanks for dropping in! Hello to Paint Party Friday! Tons of progress pics in the slideshow! Happy New Year to all my visitors and art blog pals! 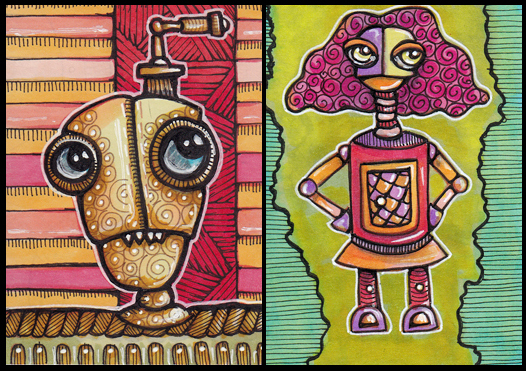 This entry was posted in ATCs and ACEOs, Copic Markers, Paint Party Friday, Progression Photos on January 23, 2015 by The Beast Tender. Honor the roll. Hahahaha! Yeah, you should definitely go with your roll! The robots are amazing. I especially love how the Sentinel, Lance, and Tim have parts that simulate TEETH. Madge is hilarious and admirably spunky. I love every single one of her parts! These are fun! Great work! Great work! Amazing creatures with fantastic color. I have some students that would just LOVE your art work! Love your weird and wonderful creatures! And you’re right about going with the flow. As long as you’re creating, it’s good! Oh those are SO cute! I definitely need to put your blog on my Feedly list and see what else you have been up to! Love Madge! We redheaded girls gotta stick together! Thanks for stopping by my blog earlier too! Actually I also found out about it 3 years ago and had missed the deadline that first year by just a few days too! LOL But it was fun last year so why not try it again! I actually got around 20 new followers last year so who knows… my aim to to be able to make a blog I enjoy and would enjoy finding, and if other people find it, then great! You are amazing and so is your art!! You are so inspiring! OH yes, you’ve got to honor the roll! These are worth the diversion. My absolute favorite is the “Clocktower Sentinel”! He’s fabulous. All creativity is good and leads to other things. Glad to see you’re staying up late and making. I always enjoy seeing what you come up with. Ok I have to agree-weirdly cute!! Cindy, Robots! You can never go wrong with Robots! I always enjoy your illustrations. Love your bright colourful imagination Cindy. I think this art roll is seriously awesome! Your ATCs lately have been knocking it out of the park! Fantastic! I love them……so creative and adorable. You have been so productive! I’m amazed by your continuing winter energy! “Honor the roll” made me smile! 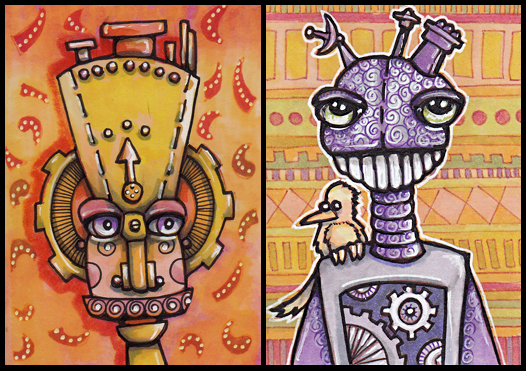 So fun, and those ATCs are super! These are really the cutest robots I’ve ever seen!